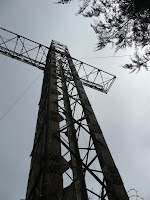 Yesterday was the last opportunity to really get out and do something before vacation ended and, having no takers, I decided to try to hike to the cross of Alajuelita. In actuality, there are three crosses, which you can see if you click on the link to see the album that added. 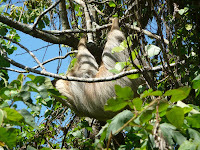 The first and most interesting thing that I saw was a sloth! Beyond that, the views were outstanding! The hike was tougher than I thought it would be (for a desk jockey), but I'm glad that I went. I ran into a group of guys at the start of the hike and they graciously allowed me to hike with them and we enjoyed goofing around during the hike. 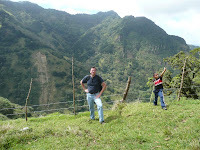 The young man who was leading the group knew the "back way" down, which yielded more gorgeous views and, after hundreds of meters of walking down the steep side of the mountain, we came to the river, which we followed back to the starting point. A tiring day, but well worth the effort.